The RCL Master Standings have been updated through games of Sunday, August 7. The Pesky Pole Dancers (Trippin Baseballs) regained a share of top spot, adding 5 points to bring their total to 113. Random ItalicizedVoice (RCL 5) jumped 2 points to hold on to their share of 1st place. Better Lucky Than Good (Partially Torn RCL) held steady at 114 league points for an indexed score of 111, which dropped them into 3rd place. Better Lucky gained another point in strikeouts, but their ERA of 4.47 for the week cost them a point in that category. The Dancers' pitching was strong as they picked up 8 wins with an ERA of 1.76 and WHIP of 0.96. Cole Hamels, Hiroki Kuroda, and Ryan Vogelsong all won a game and had an ERA under 2.00. Jonathan Papelbon and Craig Kimbrel each tossed 3 scoreless innings. Papelbon was rewarded with 2 victories, while Kimbrel notched 3 saves. Their offensive leaders included Alex Avila (10/17 with 3 home runs), Ryan Braun (.370), and Shane Victorino (.346 with 2 homers). The Voice hit .304 this week with 13 home runs and 46 RBI. Their pitching recorded 6 wins and 3 saves. Top performers included Victorino, Michael Morse (.452, 8 RBI), and Desmond Jennings (.357 with 2 home runs and a steal). RIV also benefited from Brett Lawrie's promotion (5 for 11 with a home run). Tim Hudson, James Shields, and Mat Latos paced the pitching staff. I94 Series (Puff Puff Give) gained 13 points (62 to 75) and 115 places in the standings (259th to 144th). They hit .309 (95/307) with 54 runs, 17 home runs, 56 RBI, and 8 stolen bases. In 77.2 IP I94 had 69 strikeouts and recorded 6 wins with an ERA of 2.90 and WHIP of 1.25. The Razzball Commenter League master standings have been updated through games of Sunday, August 21. Random ItalicizedVoice continued their charge, stretching their lead despite a drop in the RCL 5 Competitive Index. They now have 117 points, 5 ahead of Better Lucky Than Good (Partially Torn RCL). Pesky Pole Dancers (Trippin' Baseballs) continued to slide, dropping 2 points to 108, but they did hold on to 3rd place. The Voice hit .328 for the week with 19 home runs and 59 RBI. They scored 53 runs and stole 11 bases. Carlos Gonzalez (.364/3 HR/11 RBI) and Joey Votto (.400/3 HR/ 8 RBI) paced RIV, while Desmond Jennings chipped in 5 steals. Adam Jones (.409), Alex Gordon (9 RBI/2 SB), and Victor Martinez (.348/6 RBI) also provided big contributions. On the pitching side, they recorded 5 wins, 7 saves, and 71 strikeouts with an ERA of 2.86 and 1.11 WHIP. Brandon Morrow (12 K/1.50/.083), Roy Oswalt (9K/0.00/1.13), and Tim Hudson (9K/1.20/0.80) led the Voice. Neftali Feliz and Mark Melancon each picked up 2 saves. Amish Mafia (Sonic Death Monkey) jumped from 61 to 70 points, moving up in the standings from 269th to 180th. Murine Massacre (Tommy Waits Bottle Dodgers) gained 5 points and moved into the top 10 with 103 points. The ECFBL took over top spot as the most competitive league with a CI of 104.665. The Dread Pirate Rides Again is close behind at 103.989. The Master Standings have been updated through Sunday, September 4. Random ItalicizedVoice (RCL 5) stretched the lead to 5, raising their total from 117 to 119 points this week. Better Lucky Than Good (Partially Torn RCL) held steady at 114. Pesky Pole Dancers (Trippin' Baseballs) closed the gap to 2nd place, gaining 3 points to 113. Buc Lovereath Monk (Sonic Death Monkey) jumped from 8th to 4th with a 3-point gain. Rounding out the top 10 were reverse schmohawks (RCL 17), Big Z's Anger Management (RCL 33), Team Beefcake (Too Drunk to Call a Cabrera), THE VILLE AL KOHOLIC A (ECFBL), Colicky Fuddruckers (League of Razz and Balls), and a second team from Too Drunk to Call a Cabrera, Buchz and Dunn. Turd Ferguson (RCL: The Number 23) moved from 67th to 25th with a 10-point jump, from 86 to 96. The Voice hit just .243 for the week with 12 home runs and 41 RBI. They scored 42 runs and stole 10 bases. Carlos Gonzalez (.227/0 HR), Joey Votto (.192/0 HR) and Desmond Jennings (.111/0 HR) all cooled off. RIV's Jays helped out though, with Jose Bautista and Brett Lawrie combining for 5 HR and 15 RBI, plus 3 steals from Lawrie. Alex Gordon added 2 homers and 2 stolen bases while hitting .345. The Voice's pitching staff picked up 4 wins and 13 saves with 59 strikeouts and an ERA of 3.31. They gained 10 saves on GIMME MAH SPOTLIGHT!, the team they are chasing for an extra point, but still trail them 123-103. Bobby Parnell led the way with 4 saves, despite having an ERA of 5.79 and WHIP of 1.93. The ECFBL continues to be the toughest league with a competitive index of 105.47. The Dread Pirate Rides Again is next at 104.55. 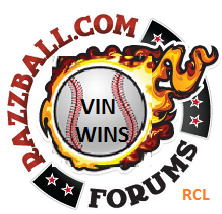 The Razzball Commenter League Master Standings have been updated through Sunday, September 18. With only 10 days to go, Random ItalicizedVoice (RCL 5) appears to have a stranglehold on the RCL championship, leading Better Lucky Than Good (Partially Torn RCL) by 6 points. The Voice did not have a particularly good week, hitting .237 with 5 home runs and 30 RBI. They won 3 and picked up 4 saves, with an ERA of 4.20 and WHIP of 1.37. But, it only cost them 1 point in the standings, and their lead held steady. Team Beefcake (Too Drunk to Call a Cabrera), Nuclear Porcupines (RCL 3), and Big Z's Anger Management (RCL 33) are all another 4 points back. The Pesky Pole Dancers (Trippin' Baseballs) dropped to 6th while Colicky Fuddruckers (League of Razz and Balls) moved up from 9th to 7th. The Buzz (Your Mom's a Schmohawk) continued their rise up the standings, moving up 4 to 8th place. Team K RoC (RCL 22) and Oakland Oaks (Matthew Berry is a Tool) each jumped 8 spots into the top 10. Carlos Santana led the way, hitting .364 with 4 home runs and 6 RBI. Adrian Beltre (.270/4 HR/6 RBI0, Carlos Beltran (.467/3 HR/6RBI), and Alex Gonzalez (.478/2 HR/6 RBI)also had big weeks. Javier Vazquez, Tim Hudson, and Chris Carpenter paced the pitching staff, combining for 28 strikeouts, 3 wins, and an ERA of 1.13. Jason Motte, Jordan Walden, and Craig Kimbrel each added 2 saves.